One of the most sought-after places by the devotees of Lord Krishna, the ISKCON Temple is located in Raman Reti, Vrindavan, Uttar Pradesh. The temple is also known as the Krishna Balaram Mandir. Mathura Krishna Balarama Mandir is a beautiful temple made of marble, which was built in the year 1975 in Uttar Pradesh. The presiding deities of the temple are Radha-Syamasundara, Gaura-Nitai and Krishna Balarama. The temple attracts devotees and tourists from all over the world. 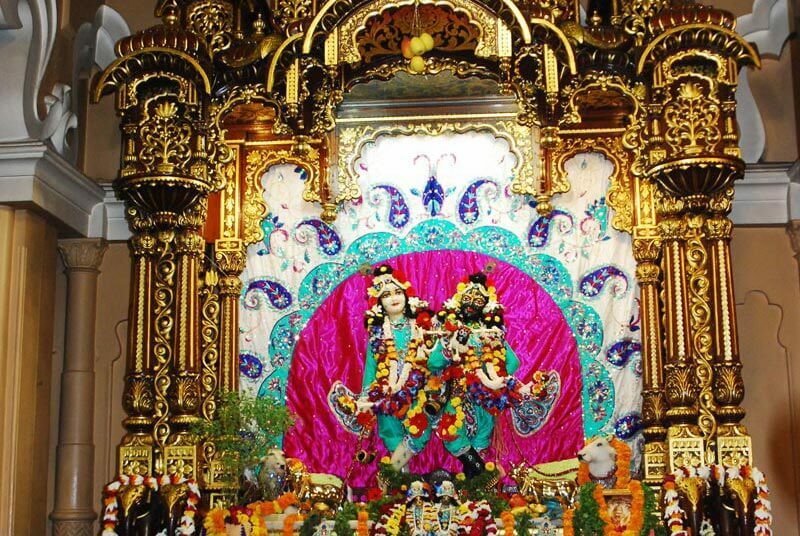 Krishna Balarama Mandir was set up by the divine grace of Bhaktivedanta Swami Prabhupada. He was the founder acharya of the religious society that is famous all over the world, the International Society for Krishna Consciousness popularly known as ISKON. The Samadhi Mandir of Swami Prabhupada is located in front of the temple. After his demise in 1977, his body was laid to rest here. The house Swami Prabhupada has been converted into a museum. A guest house, goshalla, restaurant and a gurukula are also located here. The divine brothers, Krishna and Balaram, are revered on the chief altar that is located in the centre of the temple. The shrine displays the divine bond shared between Krishna and Balaram. The shrine is a white marvel, with intricate designs on its pillars and bright paintings on its walls. The serenity of the temple is well reflected in its structure. A magnificent work of art fuelled by sheer devotion, these wall paintings provide a glimpse of the childhood days the Lord Krishna spent with his elder brother Balaram. The two brothers are poles apart in nature as well as appearance. Balaram has a quick temper whereas Krishna is known for his pleasant nature. Krishna is dark, having curly hair, while Balaram is fair and has straight hair. The chanting and devotional music will get you immersed in the loud chants of the Maha Mantra: Hare Krishna Hare Krishna, Krishna Krishna Hare Hare, Hare Rama Hare Rama, Rama Rama Hare Hare . All of the content on this site is made available at no charge, for the benefit of the community.